Your enthusiasm can be contagious, helping to move things along that seem to be stuck in a quagmire of complexity. Personal matters need extra attention, and if you fail to give quality time you may lose something of great value. Your vitality can be at a low ebb, particularly if emotionally charged situations are starting to get to you. For more physical energy, delve into your emotional concerns and let go of things you can’t control. Family pressures can be the result of shifting priorities, and if you’re tempted to drop out of the picture you could lose a chance to bring a positive influence into a changing situation. Connect with siblings during the Moon on April 15 to find your common ground. New romantic interests blossom after April 12, although you do not see eye to eye about values. Keep an open mind and look for your point of merging. Although Mercuiy turns direct on April 2, there may still be trouble getting things to work properly for a while. Deception can be costly, too, and losing ground due to changes beyond your control can be excessively frustrating. Keep lines of communication open, and look for investments of time and energy that allow you to revamp or retool in some way. 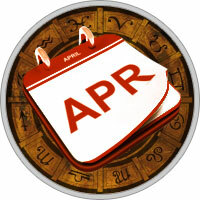 Superiors bring pressure during the Moon on April 30, so be sure you know what they want from you. Eliminate things that are not working, let go of costly situations, and end alliances that inhibit your growth. It’s all part of the scheme — but destruction is not a requirement!